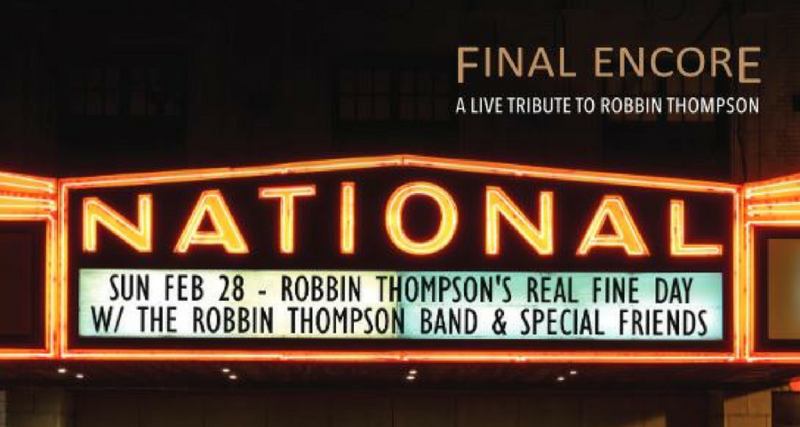 This highly anticipated release of the 2016 tribute concert honoring Richmond musical luminary Robbin Thompson includes an unexpected treat — a previously unreleased song that the band found and finished earlier this year. The album will debut on August 3rd. While producing the album, which includes 19 songs performed in the show, guitarist Velpo Robertson remembered “Solid Ground,” a song Robbin had written and recorded as a rehearsal demo shortly before he passed away in October 2015. Velpo and drummer Robert “Rico” Antonelli tracked down the music files with the help of keyboardist Eric Heiberg. After alerting band bassist Audie Stanley, they enlisted fellow musicians Steve Bassett, Jon Carroll, Jody Boyd and Marna Bales to round out the project. The song is the closing track on the CD, thus truly becoming the band’s final encore. In addition to capturing all of the performances from the emotional and celebratory concert, this album also offers listeners another extra — the stories the performers told about Robbin that night from the stage of The National Theater. These entertaining and often humorous reflections offer intimate glimpses into the various artists’ relationships with Robbin, and include anecdotes ranging from early in his career to tales from the later years. They offer insight into how Robbin amused and inspired them — and more than one mentions his wife Vicki and her legendary cooking. Along with The Robbin Thompson Band and Robbin’s long-time friend and “Sweet Virginia Breeze” cowriter Steve Bassett, the album features a coterie of Robbin’s musical collaborators and colleagues from across the country. This album truly captures the spirit of the evening and ends on Solid Ground. To ensure that Robbin’s commitment to music education in the Richmond community lives on, Robbin’s family and friends have established The Robbin Thompson Endowment for Youth in Music to provide scholarships and funding for aspiring young artists. The album will be available for purchase online on August 3rd and will be also be available at Plan9 Music and BK Music. For more information or to arrange phone or personal interviews with the band, contact Rikki Rogers at 804-543-4774.